pH is used every day whether in life and science. It plays an absolutely important role in determining the acidity or alkaline of many sectors like - food, pool, hair, soil and hydroponics as well. In soilless growing, checking the pH of your solution before planting, and frequently rechecking is a must. All hydroponic gardeners should always have at least 1 pH tester. pH (potential of hydrogen) is a numeric scale of hydrogen ion concentration of a solution. These ions are composed of positive (hydrogen - H+) and negative (hydroxyl - OH-) ones. If the water solution contains more positive hydrogen than negative ions, the solution ends up acidic. In contrast, more hydroxyls existing in the solution than positive ions lead the solution to be alkaline/basic. To put it more simply, pH is the measure of how acidic or basic a solution is. It is calculated on a scale from 1 - 14. a pH less than 7 is acidic. Meanwhile, an environment with pH more than 7 is known to be basic. Only absolutely pure water has a pH of 7, also known as pH neutral. Examples of acidic substances include lemon juice, vinegar, and coke. Milk, baking soda, and ammonia are instances of basic items. As water normally has a neutral pH, mixing with chemicals and nutrients causes the water environment to turn either acidic or basic. So pH is a crucial indicator of how the water has been changed chemically. pH is calculated in "logarithmic units". An incremental unit is equal to 10 times. For example, a solution with pH 5 is 10 times more acidic than the one with pH 6. Some inexperienced Hydroponic growers get slipped off the pH checking step for their water system. Don't fall into that hole as knowing the pH level of your solution is a critical task. The pH number lets you know how soluble the nutrients in the water mixture are. It determines the mobility of these nutrients, and hence the plant uptake ability of these nutrients. 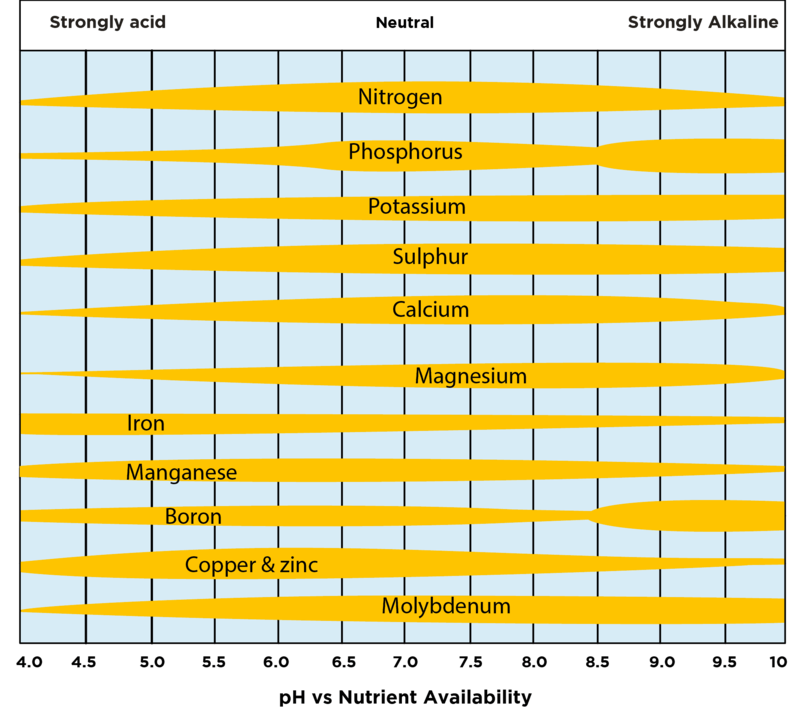 Each mineral has a specific tolerance to a respective pH level. Normally, main macronutrients (nutrients that are needed in large amounts) are hard to move in too high, or too low pH environment. That makes it difficult for plants to absorb them, which results in deficiencies. Meanwhile, Micro-nutrients (nutrients that are required in small quantities) are usually easily affected at the far end of the pH scales. Too low of pH and micronutrients are so soluble that plants get an excess of these nutrients. This can lead to plant toxicities. Too high of pH, these micronutrients become less mobile and plants' ability to take up these nutrients is reduced. Often, the first indicators that pH has gone out of the optimal range are the younger foliage of plants turns a little yellow or pale. Growers can know that plants have failed to get sufficient important nutrients. Nutrient Availability - What is the ideal pH for Hydroponic plants? The above chart shows essential nutrients for plants and the pH level to which plants can absorb these nutrients. The thicker a line of nutrients is, the better plants are able to take up them. As shown, when pH moves to the both ends, plants' ability to absorb a number of nutrients is severely affected. So, the ideal spot where plants can take up many minerals is in the middle, precisely from 5.5 - 6.5. This is also the range that is commonly suggested for most hydroponic crops. The suggested range above is for Hydroponics. Soil growing may require a slightly higher of pH. Even though different plants may require different pH, most plants are safe within this range. Most plants prefer to live in a slight acidic growing environment. In commercial greenhouse or hydroponic crops, the pH range is kept at a tighter range within 5.8 - 6, which is done by the automatic recirculating systems that fill acids to adjust the pH level to the correct level upon pH changing. Your job as a grower is to keep your pH balanced in the range recommended. As pH drifts past the proper level for plants, a number of issues can arise as described. That's the reason why you need to develop a schedule to check the pH of the solution on a frequent basis. 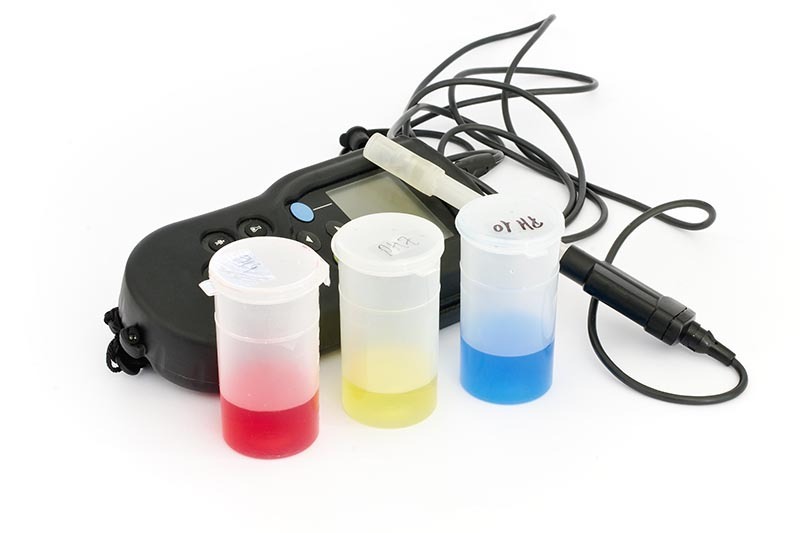 There are a variety of tools to determine the pH levels, ranging from the low-priced easy-to-use paper strips and liquid test kits to the expensive high-tech digital meters on the market. Test strips are no doubt the cheapest methods for pH checking among the ones listed here. Essentially, you would dip the strips into the nutrient solution. And the sensitive dye of the strips will change color. Comparing the color to the pH color chart will let you know how acidic or basic your solution is. The downside of these strips is that it does not give an accurate measurement because it is based on color checking on the strips, which is quite hard to read. If you are a novice, short of money, or you want an easy method, test strips are a good to go. Like test strips, the liquid test kits is really plain and simple to use. But it gives a highly accurate and reliable result of pH checking. To use it, you would add some of the pH sensitive dye drops into a small cup with your solution inside. Then check the color change of the solution with the pH chart color chart. The liquid test kits are slightly more expensive than test strips, but the results are much more accurate. That makes it become the most popular pH checking method by hobby hydroponic gardeners. As the most high-tech method of pH checking, the electronic meter shows the result very fast and accurately. pH number will be printed on the device’s screen. So no needs to compare to the color chart. There is a variety of electronic pH meters with different sizes and prices. But a pH pen is the most used among hydroponic hobbyists. Despite the best and fastest pH measurement of all pH testing methods, the digital meter has a disadvantage as being the most expensive and it needs taking good care of. Meter can drift after some time and shows inaccurate results. The pH pen needs continuously cleaning and careful storage for its life extension. It's a good idea to also spend a few dollars for a liquid pH test kit or strips to double check the accuracy of the electronic meter or in case the meter breaks down. You can regulate the pH level of your solution simply by adding some phosphoric acid to lower acid, or potassium hydroxide to raise the pH. Some people bring the pH down by using white vinegar (acetic acid), citric acid. But these acids are quite weak, which doesn't bring good long-term pH lowering result. There are also specifically made pH up and pH down solution that is sold on the market. I recommend these available solutions because they are very easy to use, and bring effects fast. It also comes with pH buffers that help recirculate the pH to the proper levels. And because you are using acids to adjust the pH level, there are some words of cautions. Be sure to protect your eyes and skins when working with acids. Better safe than sorry. And if you are to mix a concentrated acid to water, never pour water on to acid. The acid will heat immensely and can spit high-temperature acid to you. Instead, drop the acid slowly to the water, stirring and noticing if the solution gets hot. 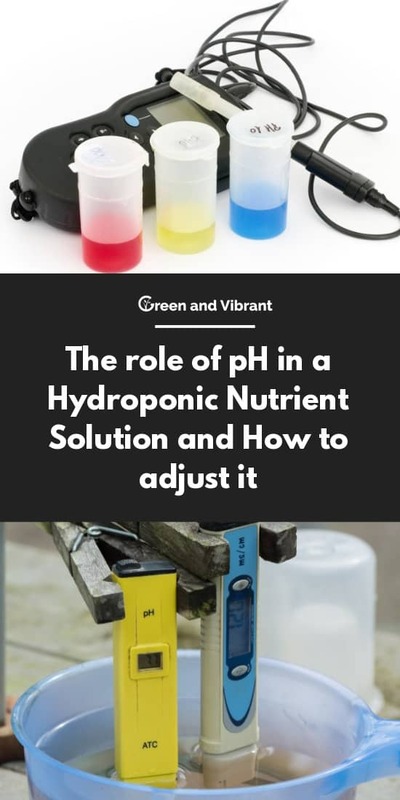 The pH checking and adjusting step should only be done after you have mixed the nutrients with water after you have diffused them, and let it circulate throughout your system. This is because the chemicals of the nutrients will change the pH level of the water. Different hydroponic systems, growing media used, nutrients, plant types and even the climate can disrupt the pH of your solution fast or long. For Hydroponic beginners, I recommend you to check it daily to know if your system pH is changed easily or not. Then adjust it accordingly. Experienced Hydroponic gardeners may know how long to check and adjust that level. pH level of the system is important. Your job as a Hydroponic grower is to measure and adjust pH in the nutrient solution for plants' best ability to take up essential nutrients. There are a variety of testing and adjustment products on the market to help you do the job and with the knowledge I have provided, don't let your plants face growth issues just because of the pH levels. I just came upon this info about Ph and I thank you so much for this very helpful instructions. I have been growing hydroponically now for a couple of years. I always tested the PH of the water before I added the nutrients and left it at that. I was not aware that all of this could or would change after the nutrients were added and could change daily even. So I was not doing a regular PH testing. But now I will do it.